Sometimes all we need is a little inspiration to spark a whole lot of creativity. Some of the most fun “writing prompts” I use in class are picture prompts. The wackier, the better! The pictures allow for the kids to provide a lot of detail and interesting “facts” describing the what and the why of each picture. I add fun pictures that I find online to one of my boards on Pinterest. Follow Traci Clausen – Engaging Teaching’s board Writing Picture Prompts on Pinterest. 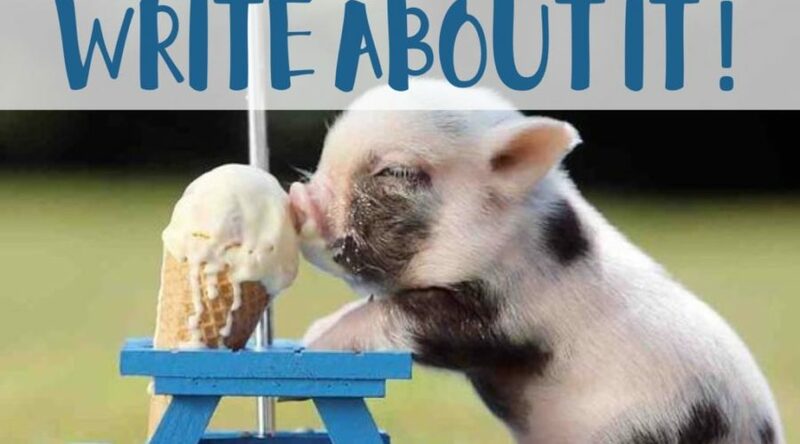 There is a pig eating ice cream. The pig is sitting on a bench. There is an umbrella above the pig. The ice cream is dripping. The ice cream looks like it is vanilla. This type of activity is perfect for beginning writers because the picture is engaging and their sentences can be about specific details that they can see. The crazier/wackier the picture, the more details students available to the students. 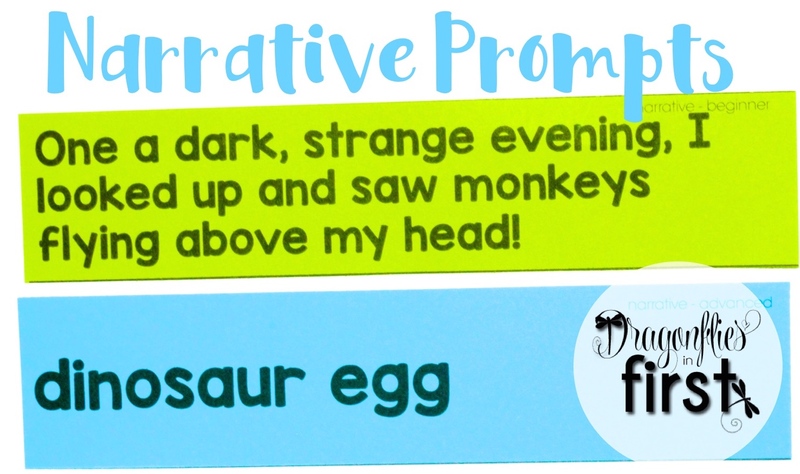 Because I often like the kids to select their own prompt to expand upon, I give them a tub of prompts to choose from. I do a lot of plan-based writing (as opposed to “off the top of my head” details or a tedious writer’s workshop (see Confession of a Writer’s Workshop Loather). The more you use familiar writing plans in class (they’re a quick and easy addition to your week), the better students become at writing paragraphs (even MULTI paragraphs!). Utilizing these prompts give them choices while they work on mastery of some very important writing skills. Since our standards ask a lot of our little peeps, we have to ensure that our activities meet those expectations. Students need prompts that not only allow for narrative creativity, but also evidence based information and detailed opinions. The Write About It! resources include prompt cards for expository, opinion and narrative paragraphs. For each genre, there is both beginning and advanced prompts. Beginning writers need a little more direction and concise prompting. Advanced writers benefit from more open-ended prompts. The Write About It! prompts can be used in many ways in your classroom. One of my favorite uses is just to get students talking (about something other than Shopkins… I do not get those things!). Using paragraph plan structure to structure a discussion is a fabulous way to help cement paragraph writing schema. Once you get them thinking and talking in sequence or detailed examples of a topic, they are better skilled at writing that way! In Write About It! I’ve included writing lessons. Teaching writing is a stressful part of the day for a lot of teachers. My goal is to make it easier and a lot more fun! I’ve included writing plans and stationery templates that can be used with any writing prompt/assignment. There are Write About It! resources for every season, plus one for use throughout the school year. A BUNDLE of all of the resources is available at a HUGE discount! Each individual resource contains 36 prompts. There is a combination of beginning and advanced prompts for explanatory, opinion and narrative topics. The bundled resource contains 180 differentiated prompts! That’s more than one for every day of the year! It is a perfect addition to word work, daily journaling, morning discussion/meetings, and writing assessments. I promise, it’s easy to get your kiddos writing on a daily basis. Fun, too! Using crazy pictures, and interesting, engaging prompts encourages kiddos to think, process, expand and detail ideas – both orally and in written complete and amazing paragraphs!